Talkative Girl- Eyes have little eyelashes and voice sounds like a Valley girl. It's not annoying and it will listen to you like you're a god. It has a tendency of saying "like" in every sentence, but it's okay. It hardly ever complains!!! To Change: Pet it's head and talk to it. You might accidentally turn it into a Sweetie, but try again until you get it; you'll know. Clown- Eyes are cross-eyed and voice sounds like a squeaky teenage boy. It likes to fart and burp and laugh about it. It'll tell you cheesy jokes and loves its tail pulled. It dances like a weirdo!!! To Change: Pull its tail over and over again. Don't let it get a chance to tell you what it thinks; keep pulling. Stop after a bit and if it doesn't change, keep going. Sweetie- Eyes are cute little hearts and voice sounds like a baby or little kid. By far one of the best in my opinion. It likes to be pet and it sings you little lullabies all the time. It NEVER COMPLAINS. It likes to eat sweets if you have the app. To Change: Pet it's head over and over and over. It took five minutes of petting to change it, but it was worth it! Viking- Eyes are squinted evil and voice sounds like an evil old man. It constantly complains for food and tells me rude comments. It has an endless stomach. It likes heavy metal music. To Change: Use your finger to give it food. Don't take your finger out of it's mouth and keep pressing it's tongue. Do this and your Furby will make vomiting sounds. Do this a few times and it'll change. Diva/Popstar- Eyes are squinted girlishly and voice sounds like a bratty teenage girl. Don't confuse this with a Valley girl voice. It complains all day long!!! When you feed it it says "finally" in an angry voice. It brags about itself and tells you how talented it is. It sings weird songs, but when you play it music, it is BY FAR THE BEST DANCER!!! You'll get annoyed. Guaranteed. To Change: Play it music and tell it how amazing it is. Make sure the music is REALLY LOUD, like SUPER LOUD. Good luck! hey I got a new phone the other day. if not they later tomorrow. oh and also tomorrow monday 26th I am going out with my mom so you better answer!!! Don't forget to e-mail me coz seriously I rather talk there then here. I hope ya like my avatar picture.... IT'S ME!!! you can follow me on Twitter and facebook. (But to be honest I never really go on twitter). Sorry, I don't have a Twitter or Facebook. I put the email in. Weebly should send you a little notice to let you get a free website and join. Don't worry, they only send you emails if you get a milestone (5,000 pageviews, ect.). Oh and the eye's are different, they have more expression and they are funny. if ya gonna get a furby boom GET EAR MUFFS!!! and I also found out that they are much louder than furby was. I NEARLY BECAME DEAF!!! 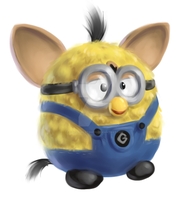 Hey I found out that furby boom is exactly like furby only it has different eye's and sounds. The personalities are the same, well how you get the personalities that is. So I don't really need to make the information when it's already there. If you want to get a free website, Weebly is great. If I suggest you, you'll get a free website. Let me know if you want that, I just need your email. 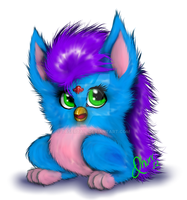 oh well furby boom and furblings are cool maybe one day I will make a website and describe the furby booms personalities. Coz I am still wondering what the personalities are. I'd assume it would be similar, but if not let me know! Hey you should make one for Furby Boom next it just came out in American!!! I wish I could, but I don't have a Furby Boom. I am saving up for a Pullip Doll instead. But thank you for a suggestion! No, but you're right!!! Cool! my sister doesn't use her Furby that much anymore so I was thinking of getting a party rocker. to tell you the true I don't have a Furby but my sister has one. You should ask her to use it! I love this site it's a good thing I read this coz I would have no clue how to change it's personality. Thanks good! I'm glad I helped you! My friend turned it into a Viking and I've been trying to turn it back to a Sweetie. We tried music and it turned into a Diva. Then after 8 minutes of petting it, it turned back into a Sweetie. ._. Thank god I found this. Oh! Good. I'm glad I helped you! 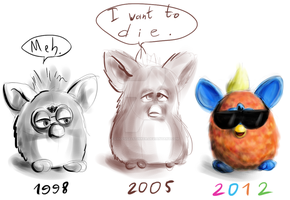 Me and two of my friends have a Furby, and after so long of being annoyed by some of the personalities, I decided to kinda figure it out. I heard there is a "sixth personality" that's an easter egg, though, but I haven't had it so, who knows! Thanks!